This recipe always reminds me of fiesta and special occasions when I was growing up in Philippines, as it was always present in the menu served to the guests. 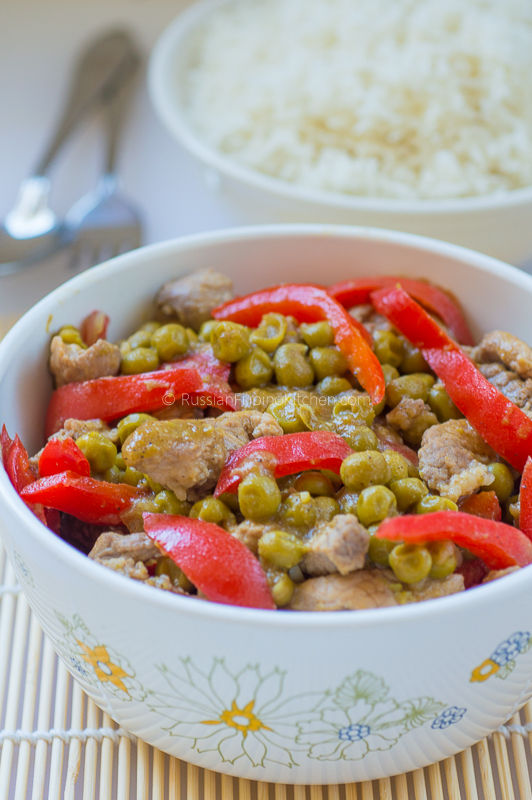 Pork guisantes literally translates to “pork with peas”. As simple as it sounds, this dish can be made several ways. 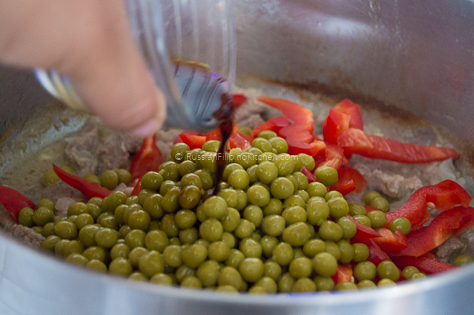 One popular version includes tomato sauce among the ingredients to heighten up the flavor. Another one I tried has liver in the dish, which makes it extra meaty. However, the recipe that I am going to share today is a basic pork guisantes without the addition of tomato sauce or organ meat. 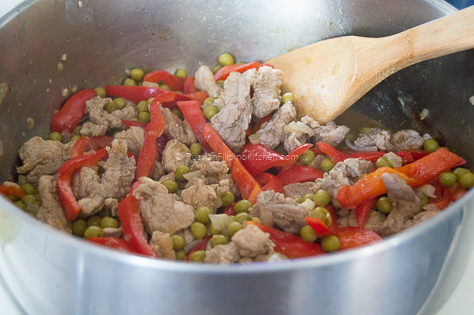 It’s perfect for those who aren’t fans of tomato sauce or liver, but still wants a tasty dish of pork and green peas. 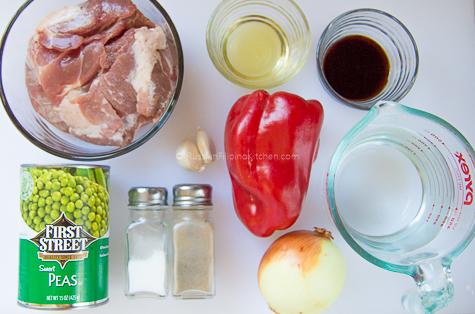 Like many Filipino meat dishes, this goes great with boiled rice. Enjoy! 1. Core bell pepper and remove seeds, then slice into strips about 1/4 inch thick. 2. 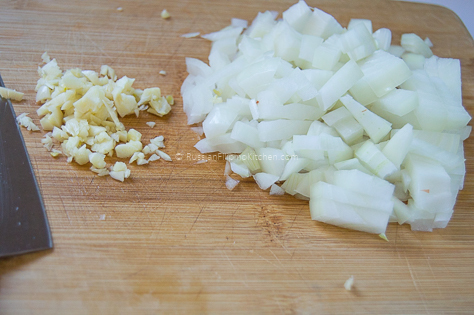 Crush garlic with the flat side of knife, peel skin off, and chop into very small pieces. Similarly, peel onion and chop into small pieces. 3. 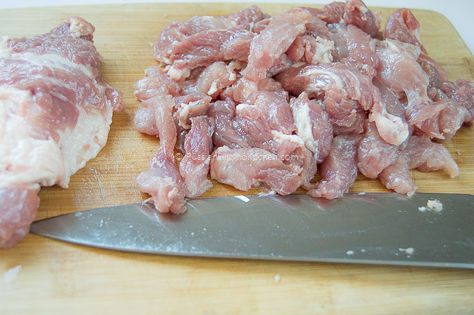 Trim off most of the fat from meat (optional), and slice into strips, about 1/4 inch thick. 4. In a saute pan or pot, heat oil over medium high heat and saute onions and garlic for 2-3 minutes until fragrant. 5. 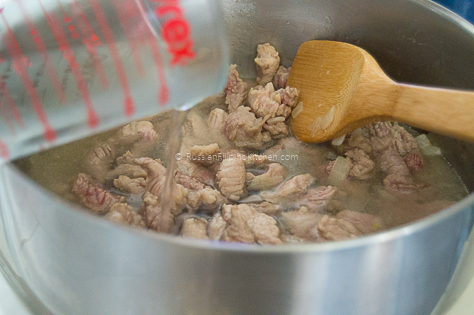 Throw in slices of pork and continue sauteing until meat has browned. 6. Add water and bring to a boil. 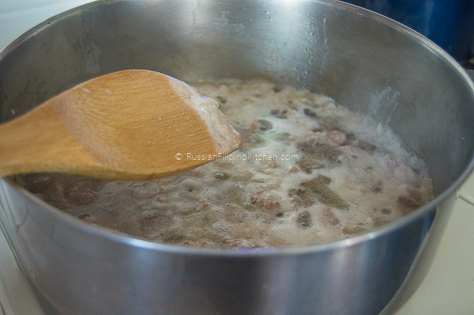 Once it boils, lower heat to medium low and simmer for 30 minutes until meat is tender and most of the liquid has evaporated. 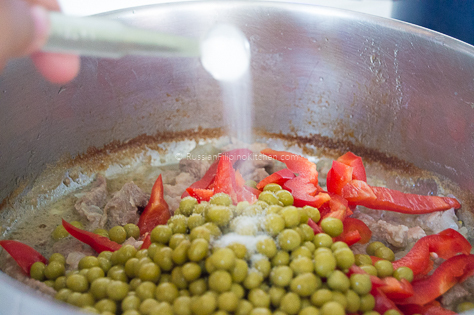 Use a spoon to remove scum that rises to the top as the meat simmers. 7. Add the rest of the ingredients and simmer for 5-6 minutes till bell peppers are limp and water has mostly dried up. 8. Serve immediately. 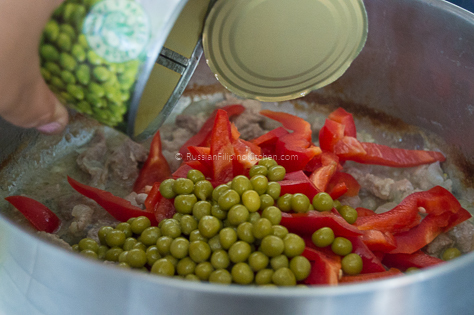 Easy pork and peas recipe also known as Pork Guisantes in Filipino cooking. 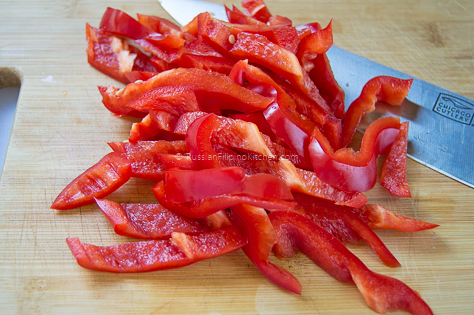 Core bell pepper and remove seeds, then slice into strips about ¼ inch thick. Crush garlic with the flat side of knife, peel skin off, and chop into very small pieces. Similarly, peel onion and chop into small pieces. Trim off most of the fat from meat (optional), and slice into strips, about ¼ inch thick. 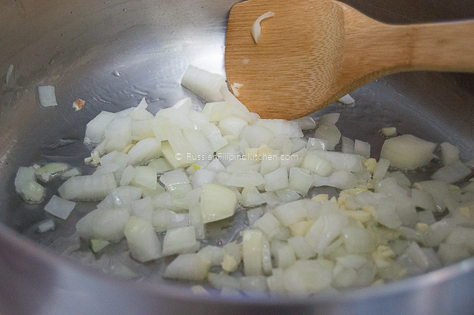 In a saute pan or pot, heat oil over medium high heat and saute onions and garlic for 2-3 minutes until fragrant. Add water and bring to a boil. 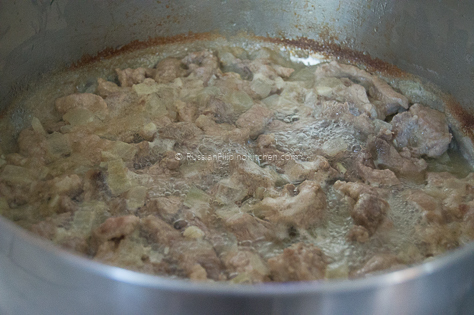 Once it boils, lower heat to medium low and simmer for 30 minutes until meat is tender and most of the liquid has evaporated. 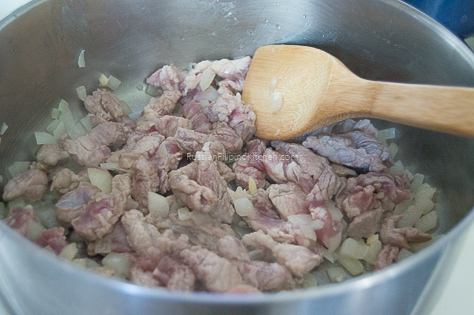 Use a spoon to remove scum that rises to the top as the meat simmers. 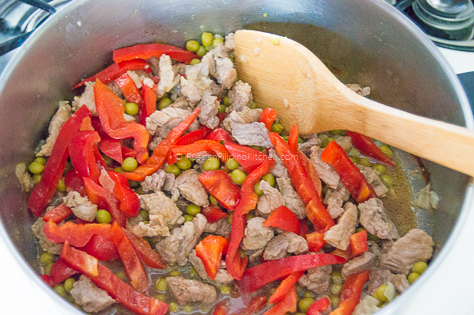 Add the rest of the ingredients and simmer for 5-6 minutes till bell peppers are limp and water has mostly dried up.